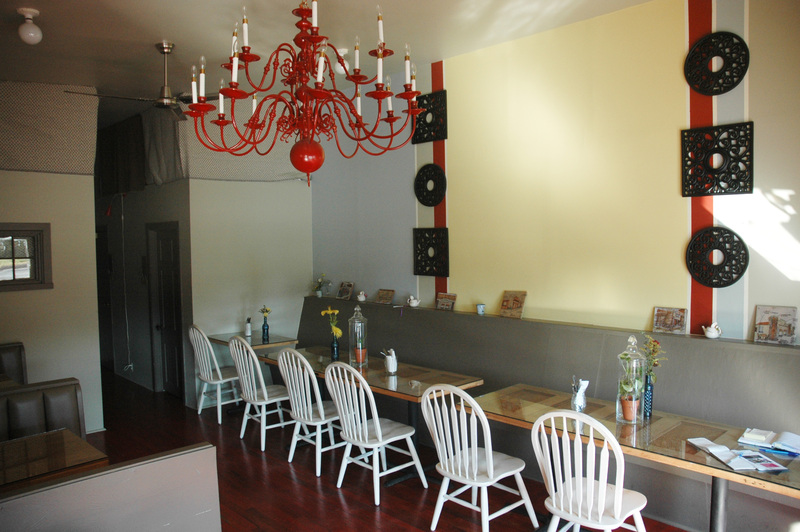 Home » Community Happenings » Find delicious treats at our small business partner Shortcake Bakery! 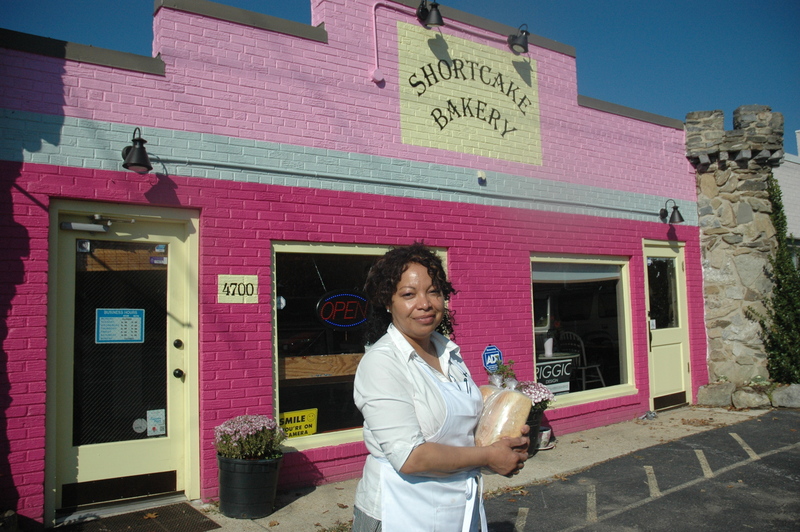 Find delicious treats at our small business partner Shortcake Bakery! While fielding a phone call from a mother planning her toddler’s birthday party, Shortcake Bakery owner Cheryl Harrington could easily agree to sell the anxious parent the biggest—and most expensive—cake on her menu. But that would be antithetical to Harrington’s overarching “waste not, want not” philosophy. So instead, she gently and skillfully assures the mother that a smaller cake will provide ample tasty dessert morsels for all of the adults and children at the birthday gathering. Everybody wins. The customer is pleased her bill won’t be as high as she anticipated and Harrington is elated that half of the cake won’t end up in a landfill. Her conservation mantra is what linked the resourceful Harrington to her unconventional and green-centric neighbor, the Community Forklift. 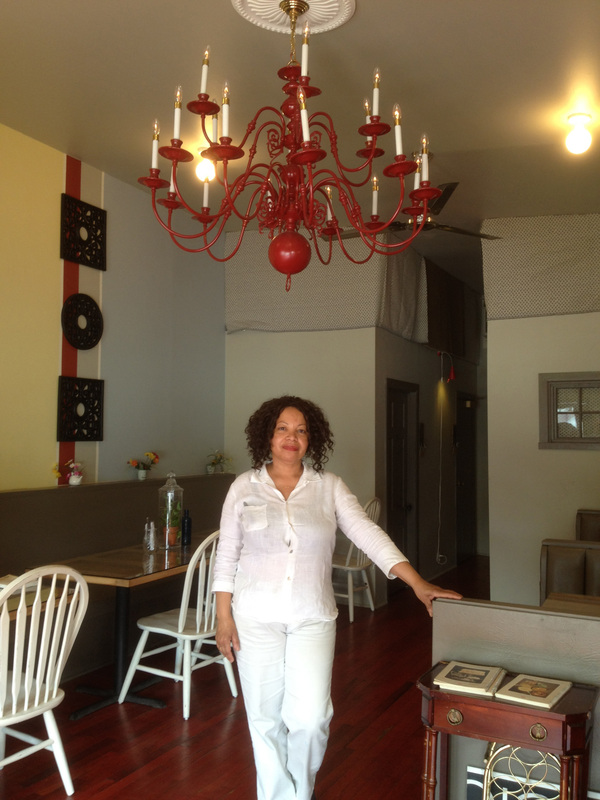 As a small-business entrepreneur, she needed affordable but distinctive staples and accents to transform the quirky building on 4700 Rhode Island Avenue in Hyattsville into the bakery that she opened in October 2011. While Harrington brainstormed about pastries, patties, pies, cupcakes, turnovers, scones, quiches, breads and brownies, she asked her designer, Erica Riggio, to delve into décor. The six glass-covered tables in the dining area of the 1,000 square feet of space are fashioned from repurposed wood panel doors, courtesy of the Forklift. Look up to spot another Forklift gem. 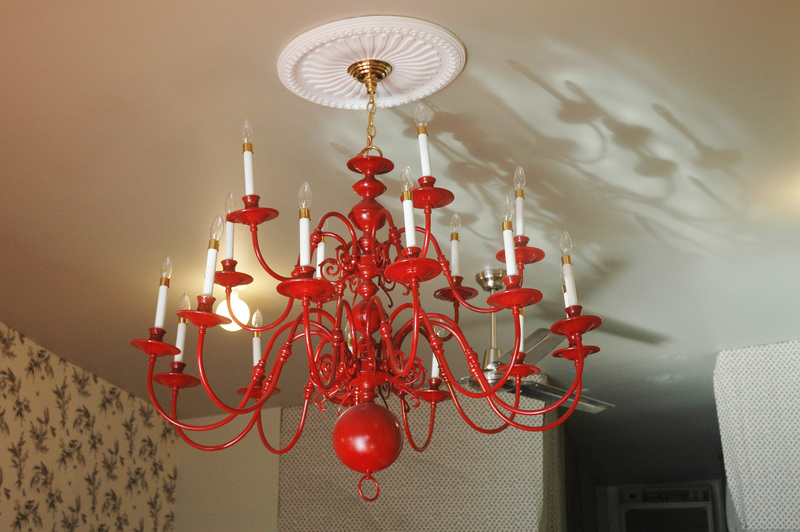 It’s a tiered, 18-torch chandelier that Riggio sandblasted and painted a brilliant red. In fact, the ceiling centerpiece is so large that Riggio is having matching sconces crafted from its extra appendages. Shortcake’s oak floors with the distinctive red hue—a vestige of the building’s previous incarnation as a restaurant called Rhode Island Reds—are yet another Forklift find. Plumbing fixtures, pipes, windows, framing materials and other items purchased at the Forklift also were part of that earlier rehabilitation. Harrington was stricken with a case of severe sticker shock when she began seriously scouting for commercial property in the summer of 2011. She fancied finding a building that met certain standards. One, it had to have a restaurant-ready kitchen and dining area; two, it needed to be adjacent to houses and offices; three, it had to be connected with the Gateway Arts District in Prince George’s County; and four, the rent payments couldn’t be so exorbitant that she would sink into debt immediately. Remarkably, she scored a four-for-four upon discovering the one-story property at the corner of Route 1 and Charles Armentrout Way. Built as a single-family home in 1931, the structure also has been morphed into a restaurant, a church and a clubhouse for bikers. It was the motorcyclists who added the stone pillars at both front corners. The original homeowners also sold ice out of their basement and tools to tradespeople. Before actually taking the small-business leap, Harrington had contemplated such a jump for about five years. She’d connected with the Maryland Small Business Development Center Network at the University of Maryland, enrolled in oodles of courses and written a business plan for a bakery. Her window of opportunity opened last year when a short-term job assignment wrapped up near the time that the younger of her two sons graduated from college. More than a year after launching Shortcake, she smiles broadly when she admits to reimmersing herself in the same swirl of flour, sugar and baking powder that she vowed to escape years ago. Her parents owned and operated a bakery in Brockton, Mass., near Boston, shortly after 11-year-old Harrington and her family emigrated from Trinidad to the United States. After spending her teen years participating in every angle of the baking business, she told herself “never again” when she moved from New England to the nation’s capital several decades ago to study chemistry and biology at Howard University. That college degree led to jobs as an insurance underwriter and as a lobbyist. Also, as chief of staff and legislative aide to Peter Shapiro when he served on the Prince George’s County Council, she had a hands-on role in watching the Gateway Arts District evolve from a paper sketch to an on-the-ground reality. She married David Harrington, a fellow Howard graduate with political chops, who is now the president of the Prince George’s Chamber of Commerce. Before that, he served as the mayor of Bladensburg, a member of the Prince George’s County Council and as a Maryland state senator. Though Harrington has hired two interns from a couple of local community colleges to share the baking load, she still regularly pounds out 90-hour work weeks to satisfy the Hyattsville region’s sweet tooth. Long days and nights spent in the cozy kitchen behind the bakery’s cupcake-colored pink façade mean extremely limited time for family, friends, hobbies and yoga. But in her spare minutes, the 50-something Harrington is scheming a facelift for the service side of her business. For instance, she wants to upgrade the pizza oven she inherited from the previous tenant and make the area more appealing and customer friendly. Her designer is already plotting more reconnaissance missions to the Forklift. Harrington readily confesses that her weakness for the Forklift’s magnetic pull isn’t just professional. Her house is evidently a testimony to her fondness for solid wood doors, window frames with the old-fashioned wavy glass and an assortment of other items.